Yesterday, Microsoft made Windows 10 available across 190 countries and the fan celebration in 13 different cities worldwide was pretty much a success. Although, some people were able to upgrade their devices while some of them do experience difficulties, with the upgrade notification not showing up. One question we have been asked, Will my Lumia get Windows 10? Microsoft is determined to get all Lumia devices a Windows 10 update in the future, but not all Lumia devices will get it on first launch. Read on to find out more. 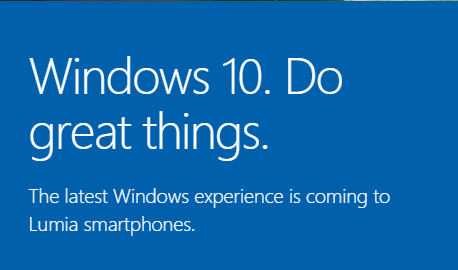 According to Microsoft product page for Windows 10 mobile, NOT all devices will get Windows 10 when it is first launched. There will be only a specific set of devices to receive the update. In fact, devices like the 630, 530 and 520 don’t appear in the list. Most noticeably, the Lumia 530, 520, 630 and 635 are absent from the list despite being the most popular Windows Phone devices. The 1520, Lumia Icon and 730 are absent despite sharing the same specs as the 930 and 735. But do not worry if your phone doesn't get it when it first launches, your Lumia can run Windows 10 via Windows Insider so even if you do not get the update via carrier, the Windows Insider app will allow you to get the update for yourself. What do you think of this upgrade process? Do tell us in the comments below. Also don't forget to share the news!